UNDER normal circumstances, the visit of Iceland would hardly be a game to set pulses racing. And after the awful injury suffered by Seamus Coleman against Wales, it seems almost indecent to be talking about another football game. But one thing football does is move on and I must say, I am looking forward to seeing Iceland. I remember writing after the Euros last summer that England could do no better than hiring Heimir Hallgrímsson and his staff en bloc and they might have a chance of doing something better than Roy Hodgson managed. Instead they picked Sam Allardyce who barely had his foot in the door when he was turfed out. I also remember thinking that Euro 2016 was a watershed moment. The minnows arrived in force and this time made an impact, something which has been threatening for a number of years. A broad evening out in standards across a lot of teams dragged some of the big nations into the pack and some of the very small teams up to mid-table. 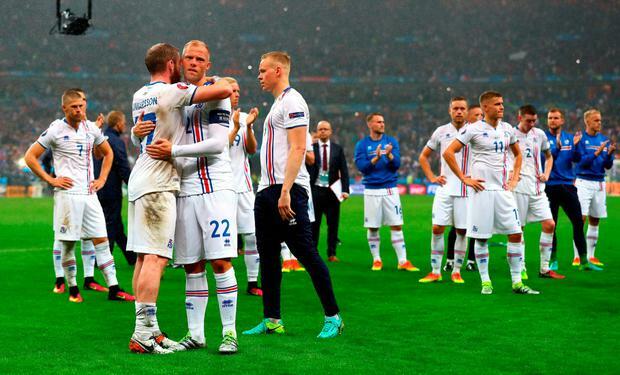 But Iceland did a lot more and so too did Wales, Northern Ireland and Martin O’Neill’s team. They didn’t just make up numbers. They won games, beat teams and in Wales’ case, got within touching distance of the final. I think there are two major factors at work. I think bad management is responsible for the decline of many nations and I think good management is the reason why Iceland did so well in France. I also believe that there are now fewer true match-winners in the game and that teams prepared to work hard for their goals will prosper. Wales had one world class player Gareth Bale and look how far that took them. Underpinning his ability was a well-organised, disciplined and hugely enthusiastic group of fairly ordinary professionals managed by Chris Coleman. Michael O’Neill is clearly capable and our own O’Neill has a weighty CV. All of them know how to build team morale. A very good example of this is Antonio Conte who took what was generally seen as the weakest Italian squad ever to travel to a major championship finals and turned them into a contenders. Italy went out in a penalty shoot-out to Germany in the quarter-finals and Conte was acclaimed for what he did then set off for London and his new job. We’ve all seen what he has done with Chelsea, how a really good manager makes all the difference. Iceland have not dropped off after the Euros and I’m not surprised by that either. From the teams mentioned, only Wales have lost some ground and that is still recoverable if increasingly unlikely. When it takes hard work and a lot of concentration to reach a goal, good players do not want to let that go. These Iceland professionals have good habits and that means they are always willing to learn. Everything is new right now.